With his legacy of both racing and show ring champions in this state and beyond, the Thoroughbred Northern Raja is a natural choice for this year’s Maryland Stallion of Distinction. His offspring’s successes on the track were recognized for several years before Northern Raja also became known as a premier sire of show hunters. Born and bred in Kentucky, he lived most of his life at Worthington Farms in Glyndon. J.W.Y. “Duck” Martin, Jr. and his wife Glennie Reynolds Martin own the lush pastures of Northern Raja’s Maryland home. J.W.Y. Martin, Sr. first purchased this historic farm in 1937, and it is there that three generations of Martins have bred race, hunt and show horses. Since 1922, the farm has also been the home of the Maryland Hunt Cup, the most prestigious and challenging timber race in the US. Northern Raja was sired by Raja Baba, a son of the powerhouse Bold Ruler. Raja Baba earned $123,287, with seven wins and 12 places in 41 starts. He retired to stud at age four, standing at Hermitage Farm in Kentucky and siring 15 crops of foals. In 1980, Raja Baba was the leading general sire and leading sire of two-year-olds by earnings. He ultimately sired winners of over $24.6 million, including 62 stakes winners. When the Eclipse Awards were handed out, his daughter, Sachuista, was Three-Year-Old Champion Filly and she won over $1.3 million, including the Breeders Cup Distaff. His son, It Is True, won the 1988 Breeders Cup Juvenile in a huge upset when he defeated the favorite, Easy Goer. Raja Baba is also known not just for his racing offspring, but also for siring stallions who themselves produced champions. Such stallions include Knick Press, Unfold, Well Decorated, Irish Swords, Kibe, Raja’s Best Boy, Nepal, Prince Caspian and Maha Baba. Raja Baba passed away in 2002 at the ripe old age of 34, retaining his sunny disposition throughout his long life. Raja Baba’s sire, Hall of Famer Bold Ruler, won the Flamingo Stakes as a three-year-old, breaking a track record. He also won the Wood Memorial, the Preakness Stakes and was third in the Belmont. Bold Ruler earned the Eclipse Award in 1957 as the Champion Three-Year-Old, Champion Sprinter and Horse of the Year. His race record of 33 starts and 23 wins earned him $764,204. 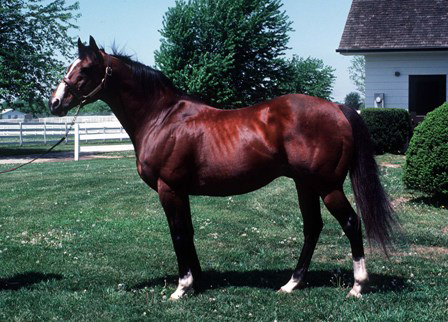 Bold Ruler retired to stud early and sired 11 champions including Hall of Fame horses Gamely and Secretariat. 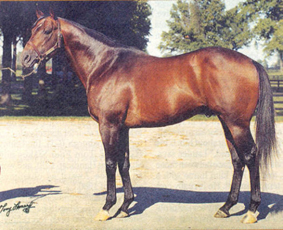 Additionally, Bold Ruler was the leading North American sire from 1963-1969 and again in 1973. Bold Ruler’s dam, Miss Disco, was by Alfred G. Vanderbilt’s famous stallion Discovery. Discovery stood at Vanderbilt’s Maryland farm, Sagamore, where Miss Disco was foaled. She was named the 1958 Broodmare of the Year and had career earnings of $80,250. 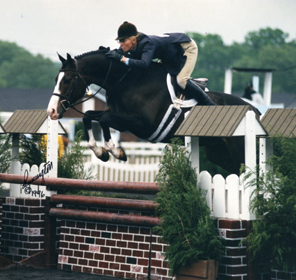 Raja Baba’s dam was the Phipps’ incredible foundation mare, Missy Baba. Missy Baba produced three other stakes winners: Master Bold, Sauce Boat (Tabasco Cat’s dam’s sire) and Chakri. Her sire was the French-bred My Babu, considered to be one of the most influential sires in the breeding of sport horses in America. Northern Raja’s lineage on his dam’s side is equally as impressive and productive. The Martin/Reynolds team purchased his dam North of Venus as a yearling in 1971, along with the colt Lord Gaylord. The mare raced 40 times, with 13 wins including the Grade 3 Pageant and Seashore Handicaps, earning $213,503. North of Venus was sired by the legendary Maryland stallion Northern Dancer, and she was at one time his leading money-earning get. Northern Dancer, standing at Windfields Farm from 1969 until his death in 1990, ultimately commanded a $1 million stud fee. He sired 147 stakes winners including Danzig, Nijinsky, Lyphard and Nureyev. Northern Dancer’s offspring also set records for prices at the yearling sales for 12 years, including the first $10 million yearling sold. North Of Venus’ dam was Fly By Venus, sired by Kentucky Derby winner Dark Star, and she had 13 wins, earning $50,795. Of her ten foals, eight were race winners. North Of Venus proved her value as a broodmare, producing Fager’s Fancy (by Dr. Fager), Northern Barbizon (by Barbizon) and Northern Raja’s full sister Raja’s Venus. Although she never raced, Raja’s Venus produced 11 foals, ten of whom were race winners. Her three top earners, all sired by Lord Gaylord, were Venus Genus ($328,272), North Lord ($121,764) and Lady Beaumont ($104,285). 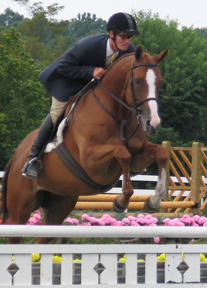 The Martin and Reynolds families owned Northern Raja in partnership, though his breeder of record is listed as David P. Reynolds of Reynolds Metals Corporation. An avid horse breeder, Reynolds was half owner of the 1994 Preakness and Belmont winner Tabasco Cat, whose dam he also bred. The Martin family owned many acclaimed flat-racing horses, including Con Amore, Abrasion, Dark Hope and Battle Jack (a world record breaker for the half-mile in 1940). The Martins also raced their horses over timber, winning the 1936 Maryland Hunt Cup and the 1936-1938 Maryland Grand Nationals with Inshore. Martin himself rode in the Hunt Cup four times, finishing second in 1969 and ending up in the winner’s circle in 1972 aboard his own Early Earner. Worthington Farms also stood the famous stallion Lord Gaylord, whose fillies the Martins then bred to Northern Raja. They bred and owned the great show mare Jessie E., who was ranked second only to the amazing Rox Dene. The strapping bay colt Northern Raja was born in Kentucky on March 1, 1978, with similar markings to his grandsire, Northern Dancer. He grew up amid the famed bluegrass country and went into flat race training there, showing great promise early on. This promise was never reached, however, as he raced only one time, finishing third, after which an injury ended his short racing career. With his exceptional bloodlines, the decision to stand Northern Raja as a sire was a natural one. And thus he came to Worthington Farms in the cradle of Maryland horse country. Within walking distance of the famed Sagamore, and in the shadow of his forbears, Northern Raja would put his own mark on the Thoroughbred. 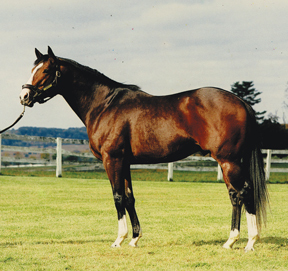 As a sire, Northern Raja had 223 registered foals, more than a few of which were out of Lord Gaylord daughters. His first foal crop hit the ground in 1983 and he continued to sire a total of 19 crops, the last arriving in 2001. Of these, there were 115 starters and 82 winners, earning over $3.3 million. Offspring of note include Purple Passion, sire and winner of $505,839, Amy Be Good ($279,804), Maypole Dance ($233,443), Ringing ($159,100) and Distant Light ($139,013). His son, Purple Passion, was one of the top Maryland-bred handicap runners of the 1990s and stood at Shamrock Farms until his death earlier this year. Purple Passion is represented by six small crops of racing age, with 18 winners including stakes-placed Don’t Tell Susan. Northern Raja is the sire of some outstanding broodmares as well. Amy Be Good produced Good and Tough by Carson City ($809,341) and Flashy Four by Storm Cat ($227,411). Summer Bloom produced Deputed Summer by Deputed Testamony ($123,207). Maundaba produced Need Less Stress by Restless Native ($117,607) and Midlantic by Allen’s Prospect ($89,494). Holly Hill produced High Hill by Disco Rico ($113,550), Will’s Hill by Will’s Way ($25,740) and Tufton by Gators N Bears ($23,240). Mackell’s Magic produced I.L.C.U. Later by Haymaker ($107,462) and Magic Comic by Purple Comet ($58,976). When his sons and daughters retired from the track, many were retrained to become foxhunters and show hunters. As these horses’ performances began to be noticed, the word spread that Northern Raja was siring big, beautiful, athletic hunters with the sort of temperament required for junior and amateur riders. Trainers started looking for his babies and hunter mare owners flocked to Worthington to breed to Northern Raja. Even the Martins began breeding more of their mares to him with an eye towards the show ring. Eclipse award winning race writer (and current publisher of Maryland Life) Ross Peddicord once described Northern Raja thus: “He was a beautifully balanced horse, stood correct and had a kind, handsome face. He stamped his get – a lot of them are well-balanced bays with lots of white, usually flashy with lots of symmetry.” Peddicord bred two mares to Northern Raja, each of which was a champion on the line and one a great field hunter. Northern Raja as a stallion had tremendous success in this venue, siring such notable “A” circuit hunters as High Hearts, Somerset Bay, Boddington Gold, Light Hearted, Northern Lights, Alexander, Annabelle, Super Sport, Slow Dance, Make a Wish, Lola, Chances Are and many more. 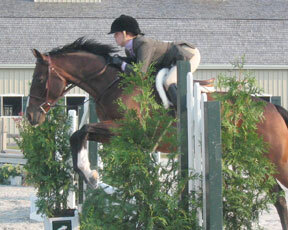 In 2003, Northern Raja was the U.S. Equestrian Federation’s 19th Leading Sire of Hunters and in 2004 he was 14th. In 2005, he was 26th and was also the second highest ranked Thoroughbred behind Unfold. Although the number of his get competing has diminished, he makes the leading sire list even today. Somerset Bay, a lovely mare bred and still owned by the Martins, was campaigned by them on the hunter circuit. 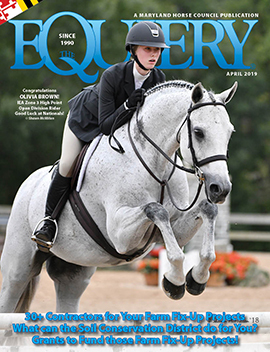 She won a number of Grand Championships at shows such as Upperville with trainer Tommy Serio. She was ranked 11th in the United States in Regular Working Hunter in 2003. After her show career she was put to work as a broodmare, with outstanding results as her foals make their mark in the hunter ring. Boddington Gold, still owned by Ann Garnett of Rosemount Farm, was a race winner of over $100,000 after which he was gelded and retrained to show by Jack Stedding. Bought when Garnett was a senior at Oldfields, the pair competed in Children’s and Small Junior Hunters. 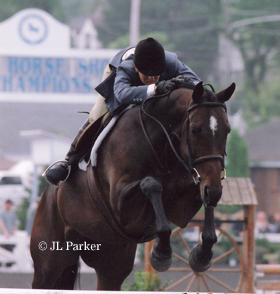 Ducky, as she calls him, was most recently — USEF Zone 3 Champion Adult Amateur Hunter in 2003. Garnett retired him to her farm four years ago at the age of 21. Lola (registered as Pazza Luna) exhibited at the top hunter shows with Mary Lisa Leffler. 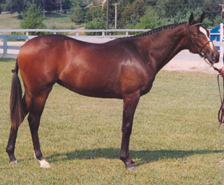 A 1997 mare by Northern Raja out of Super Thing, she was bred by the Martins and owned by Jeanne Marie Gelber until 2004. 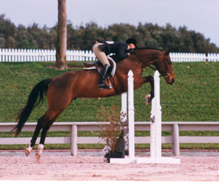 Lola won numerous championships in the hunters, including four consecutive overall Reserve Championships at HITS Ocala. Annabelle, started by Rodney Bross and now owned by High Cotton Farm, is a multiple champion in Childrens and Adult Amateur Hunters and is still actively showing. Frank Chapot bred his great jumper mare, Last Mystic, to Northern Raja, producing Northern Mystic, another well-known successful show horse. Edna Lytle owns Gwenivere and Lancelot, both homebreds by Northern Raja. They have been successful show hunters and are also used for lessons. 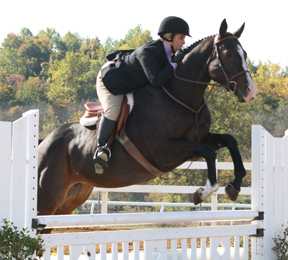 Super Sport, also out of Super Thing, spent several years in the top rankings of Junior and Amateur Hunters and recently took Skidmore College students to the Intercollegiate Horse Show Association Championships. Make A Wish, first owned by Stefany Overbeck and now Streett Moore, was a champion in Childrens Hunters. Chances Are is another highly successful hunter owned by Moore. Scottie Sherman still owns the now 21-year-old Northern Lights (registered as Torcastle) who she bought as a youngster and campaigned to a Green Hunter Zone 3 Championship before an injury cut his career short. Purchased by Denis Glaccum as a two-year-old at the Timonium sale, he was being trained as an event horse before Sherman bought him. A Walk In The Clouds (registered as Daba’s Sister) was a roan mare out of Maundy Thursday who evented successfully. She competed with a junior rider in 1999 as a “C3” at the U.S. Pony Clubs Championships East in Tetrathlon – Senior Girls, placing third. The following year, she and her owner, Heidi Nicewarner, were selected for the Senior Girls National Tetrathlon Team. Northern Raja’s second generation get are making a name for themselves in hunter competitions as well. Nokomis Farms’ young hunters out of their Northern Raja daughter Acclaim won Best Young Horse honors at several rated Hunter Breeder shows. Purple Mountain, sold for $13,000 as yearling, showed for a few years in Florida and is now siring champion hunters for his owners at Hidden Hills Equestrian Center in Alabama. “We are breeding him to all types of mares, and the results are spectacular,” says his owner Stephanie Gingles. Somerset Bay’s daughter, Bermuda (by Popeye K), was named the 2010 Champion Four-Year-Old at the East Coast International Hunter Futurity Championships and certainly seems to be headed for a stellar career. Highlands Lyric (JLA Sir William out of Purple Ink by Northern Raja) was the 2010 Grand Champion at the Maryland Pony Breeders Yearling Futurity with trainer Jennifer Thompson and owner Jeanne Marie Gelber. Faircourt Hunter Ponies have had two Northern Raja daughters; one (Raja’s Darlin) who is the dam of two champion crossbred ponies and another (Majestic Dancer) who is leased to a junior rider showing on the local hunter circuit and who will eventually be used in their breeding program. Although he died in 2003, it is a testament to Northern Raja’s prepotency, passing along his conformation, temperament and athletic ability, that so many of his descendants continue to grace the winner’s circles at shows and racetracks to this day. Somerset Bay (Northern Raja x Donaughmore by Lord Gaylord), owned by the Martins and shown by Tommy Serio, was ranked 11th in the US in the Regular Working Hunter listing and has produced numerous winning foals. Highlands Lyric (JLA Sir William x Purple Ink by Northern Raja) was the 2010 Grand Champion at the Maryland Pony Breeders Yearling Futurity for owner Jeanne Marie Gelber. Northern Classic (Nothern Raja x Margay), owned by Vivian Rall of Monkton and being shown by Brianna Harrison, pictured here at the 2010 WIHS Local Day in the Pre-Children’s Hunter division. The pair were champions! was a star – and she was for Heidi) was named A Walk in the Clouds (aka Evergreen) was actually bred to be a steeplechaser. Her name then was Daba’s Sister (Northern Raja x Maundy Thursday x Wise Exchange). 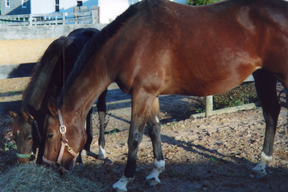 She was injured as a 2-year-old and never raced and be bought her in 1996 and boarded her at Waredaca. I think I can speak for Heidi – currently finishing up her 4th year at NY Medical College – that perhaps the greatest moment with Evergreen was competing in 1999 as a C3 – at the USPC Championships East – Tetrathlon – Senior Girls. There, she placed placing 3rd overall and the following year, Heidi was selected for the Senior Girls National Tetrathlon Team. Heidi did enjoy her very much and was able to participate in many pony club and uscta events as well as clinics with David O’Conner. David rode her once when she first got to Waredaca and didn’t like her much. Heidi also cliniced with Michael Page, who was very patient with this horse that loved to jump. For me, I loved to watch Evergreen gallop. I think Heidi had a lot of fun with her despite being such a difficult horse to ride and we are both grateful to the many instructors who were there for them. Eventually we sold her to another pony clubber who moved up to Maine. I purchased India as a four year old In August, 2001. Her registered name is Bombay Beech, out of Beech Performer, by Northern Raja. She was born in the Greenspring Valley at Houndstooth farm on April 1, 1997. She has been my dressage partner for eight years, progressing to schooling Third Level. We enjoyed doing occasional shows, practicing at home and lessons with Claire Warren and Maarta Roach. We also enjoyed our trail rides in Prettyboy Reservoir near our farm. For several years India was my mount in Company A Cavalry of the Maryland Defense Force, a volunteer part of the Maryland National Guard. We rode with the troop in places such as Patapsco State Park and at Gettysburg, PA. When a flare up of arthritis in her left front fetlock kept recurring despite treatment, my vet suggested breeding her because she has such nice conformation and a nice mind. Since I have wanted to breed horses from age thirteen (many years ago), I decided to do it! I wanted to find a nice warmblood with nice straight legs and a good mind, and not too big. After looking at eight or nine stallions in MD and PA, and also considering one as far away as California, I chose Rubaiyat, an Oldenburg stallion standing at Celebration Farm in Libertytown. So India was bred the end of May, 2009. She had an uneventful pregnancy, delivering a filly foal on Mother’s Day, 2010. We named her Ramblin’ Rose, after the Nat King Cole song. Though pretty scrawny looking when she was born, she was a feisty and curious little thing, and was nurtured along carefully at Shamrock Farm where she was born. She grew taller and stronger, and came home with India the beginning of June. Rose was just weaned, at the age of five months, and I am enjoying raising her. She now leads fairly well, and lets me pick up each foot to clean out. She likes to be groomed, and has grown a fuzzy winter coat the color of dark chocolate. She is spending her days in the company of an elderly gelding babysitter who sees himself as her protector and she is getting bigger every day. I hope she will make a nice dressage and all around pleasure horse. I named him “Alexander” when I acquired him in 2002. We never captured wins at “the big shows,” but “Alex” won my heart. There is no doubt “Alex” won more on the local BCHSA circuit than any other horse I have ever owned. However, he was also one of the most complex horses I’ve owned. I acquired him in 2002 after placing an ad in The Chronicle of the Horse looking for a horse to lease. I received a ton of emails, but mostly horses that were more than I could afford. Then I received a very short email with a bit of information about a 15.2 bay gelding who had had some time off, but could most likely return to the show ring with a little work. I immediately called the phone number, and requested a video tape. The video was most unimpressive…a shaggy bay hacking in a dimly lit indoor arena. The video showed him jumping three jumps at the trot, and then the video ended. There was something about him that I could not ignore. I called the trainer up, and told her I had made arrangements for shipping him to me. She said that I could have him for the summer as long as I provided her with some references. So, she put him on a van bound for Maryland from Baldwinsville, NY. I will never forget the phone call I received from my mom when “Alex” arrived. She said he looked like a pony. He was definitely not in show shape as he still had a winter coat with guard hairs…it was May at the time! I quickly learned when “Alex” was good…he was VERY good, but when he was bad…he was very bad. He fit right in with many of my previous horses and ponies. Usually intolerable to ride at home with fits of bucking and temporary insanity, I was determined to figure it out. In lieu of jumping and hacking, he preferred the treadmill to stay fit, and only needed a school in between gaps in showing. This worked out well as I only could ride at the shows since I was commuting between MD and NYC. Needless to say, I will never sell him due to his unpredictable nature. I never fully knew what to expect each and every time we entered the show ring. But I figured if I took a chance on him then maybe he would take a chance on me, too…and he did. “Alex” carried me to win the BCHSA adult medal finals, and the Low Adult Amateur championship in 2006 as well as the 2004 Harford Horse Show Assoc. Adult medal finals. “Alex” is happily retired at my mom’s farm (Rainbow Valley) in New Windsor, Md. Featured in your article is the lovely “Highland’s Lyric.” My mom also sold Highland Lyric’s dam, “Purple Ink” by Northern Raja to Mrs. Gelber. Thank you for sharing the stories in your article.